Bitterblue is one of those books I impulsively picked up from the library while browsing the shelves. I liked the companion novels Graceling and Fire, but for some reason, I didn't greatly anticipate Bitterblue's release - perhaps because I enjoyed the two others, but didn't love them and feel bereft when I finished them because the stories were over. And that's basically how I felt about this novel, too. I don't remember much about either Graceling or Fire, unfortunately, but in re-reading my reviews, it looks like I enjoyed the plots but wasn't very attached to the characters. And that's what happened for Bitterblue, too. While this novel tackles much more difficult subject matter than the previous two and is more subtle in its approach on how to deal with it, for me it still lacked a character that stood out enough for me to fall in love with. 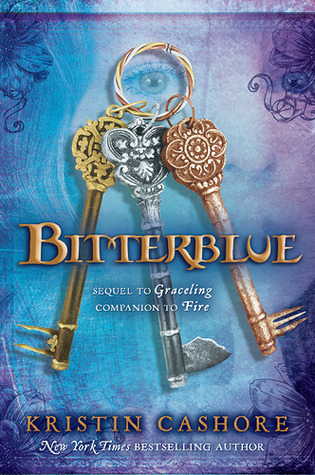 Bitterblue is the sequel to Graceling, set eight years after the events in that book take place. Bitterblue is now queen of Monsea, after the death of her tyrant father Leck. But there are many things about her kingdom that she doesn't know, and so she starts sneaking out at night. Inevitably, as all young queens sneaking about the capital in disguise do (Princess Jasmine, I'm looking at you), she falls in with two disreputable thieves who become her new best friends and teach her many important lessons about her realm. Bitterblue confronts many heavy issues in this book - in many ways, it made me think about a country after the fall of a horrible dictator. Not only Germany after Hitler, but many of the countries that are in the midst of redefining themselves after Arab Spring. How does a country recover from a dictator? Is it better to forget the past or to confront it? These aren't simple things to deal with, certainly not for an 18-year-old orphan in charge of a country. But they're also not easy to deal with in a young adult novel that has a lot of other stuff going on. Bitterblue isn't only dealing with her father's legacy, she also has advisors who lie to her, a Council under her roof with the sole purpose of overthrowing despots, a forgotten tunnel leading to an unknown country, all sorts of letters written in codes, a budding romance with a guy (who isn't really worth all the effort, in my opinion), enemy spies, and a really nice guy whom she seems to have chemistry with but no interest in (seriously blind, Bitterblue). Whew. That's a lot of ground to cover in one book, especially as Cashore makes a concerted effort to include characters from previous books in this one. But I don't remember Katsa being such a melodramatic freak or Po being so... available at anyone's beck and call. I guess what disappointed me was that this book could have been so much more than it was. Bitterblue had potential, but there was so much going on that it was impossible to really know her as a person independent of the other people in her life. And she just had no chemistry with the other characters in the story. She was heartbroken to hear about lies from her advisers, but we never saw her interact with her advisers in a meaningful way. She claimed to be in love with a guy who understood her, but they spent so much of the story glaring at each other, I'm not sure what sort of understanding they reached. She thinks of Katsa and Po as her best friends, but they're both so much older than her and so wrapped up in each other, it's hard not to feel sorry for her.